In 2013, I created my Global Equities Momentum (GEM) model that applied dual momentum to stock and bond indices. We hold U.S. or non-U.S. stock indices when stocks are strong. Bonds are a safe harbor when stocks are weak. When my book was published in 2014, I had Barclays bond index data back to 1973. Since one year of data is needed to initialize the model, GEM results were from 1974 through 2013. In 2015, I gained access to Ibbotson Intermediate Government bond data. This let me extend GEM back to 1970. The extra bond data let us see how GEM performed during the 1973-74 bear market. GEM was up 20% those two years, while the S&P 500 index was down over 40%. This was a short out-of-sample validation of our dual momentum approach. I thought 1971 was as far back as I could ever take GEM because MSCI non-U.S. stock index data only went back to 1970. But I recently obtained longer-term Global Financial Data (GFD) of non-U.S. stock indices. It is not as robust as cap-weighted MSCI data. Before 1970, GFD uses fixed country weights that adjust periodically. But it would still be interesting to see how GEM looks with the earlier GFD data compared to GEM since 1971. We usually want as much data as we can get to confirm an investment strategy. But we also have to consider how realistic our results will be under earlier conditions. Dynamic global investing, for example, makes little sense during the two World Wars. In WWI, there were strict capital controls that made it almost impossible to invest globally. These eased up some during the 1920s. But they strengthened again during the Great Depression. During WW II, they were the strongest they had ever been. Even if you could have invested globally then, it would have made little sense. Imagine a U.S. investor going to a cocktail party and saying you bought German, Italian, or Japanese stocks. You would never get invited to another party. If you were an institutional investor, you would have lost all your clients. Even if you could have done global investing then, it would have been imprudent and very high risk. Right after WW II, German stocks lost 91% of their value, and Japanese stocks fell 97%. Governments did not know how to manage their economies back then. Even in the U.S., the government made the Great Depression worse by taking austerity measures and by the not having social safety nets or safeguards like the FDIC to protect the public. So, what is a good starting date for global investing? The first academic paper to point out the benefits of international investing was in 1968 . There were similar papers in 1970 and 1974 . The first mutual fund to make global investing available to U.S. investors was Templeton Growth Fund that began in 1954. Asness, Israelov, and Liew (2017) in “International Diversification Works (Eventually)” begin their study in 1950 using GFD data. This seems reasonable. We will use January 1949 as the starting time of our data. GEM results can then begin on January 1950. We use the S&P 500 index for U.S. stocks. For non-U.S. stocks, we use the MSCI All Country World Index ex-U.S. from its start date in January 1989. It includes both developed and emerging markets. By using as broad an index as possible, we avoid possible selection bias. Before 1989, we use the MSCI World Index ex-U.S. from its start date of January 1970, and the GFD World Index ex-U.S. before then. These indices have only developed markets. For bonds, we use the Barclays U.S. Aggregate Bond Index from its start in January 1973. It holds investment grade (70% government) bonds with an average duration of 5 to 6 years. Before 1973, we use the Ibbotson Intermediate Government Index of 5-year government bonds. When the trend of stocks is up according to absolute momentum applied to the S&P 500, we use relative strength momentum to determine if we will be in U.S. or non-U.S. stocks. When the trend of stocks is down, we invest in bonds. We use a 12-month look back period and rebalance monthly. A 12-month look back was effective in Cowles & Jones’ 1937 study. It also worked best in the Jegadeesh & Titman (1993) seminal study on relative momentum and in the Moskowitz et al. (2012) seminal study on absolute (time series) momentum. A 12-month momentum look back soundly beat buy-and-hold from the beginning of stock market trading in the 1600s and with other assets back to 1223 as reported by Greyserman & Kaminski (2014). Tobias Moskowitz, a respected momentum researcher, said, "Momentum is a phenomenon that exists at 6-12 months horizons." Most academic papers on stock market momentum use a 6 or 12 month lookback. We prefer to use 12-months because there is more out-of-sample evidence supporting it. It also has fewer trades and is more tax efficient than any shorter lookback periods. Geczy & Samonov (2015) show that momentum consistently outperformed buy-and-hold back to the year 1801. Momentum applied to geographically diversified stock indices outperformed momentum applied to stocks, bonds, commodities, currencies, and sectors. That is how we use it. For more details about GEM or dual momentum, see my book. Here are GEM results compared to a global asset allocation (GAA) benchmark of 45% U.S. stocks, 28% non-U.S. stocks, and 27% 5-year bonds. This is the amount of time GEM was in each of these markets. It is also representative of a typical global asset allocation portfolio. 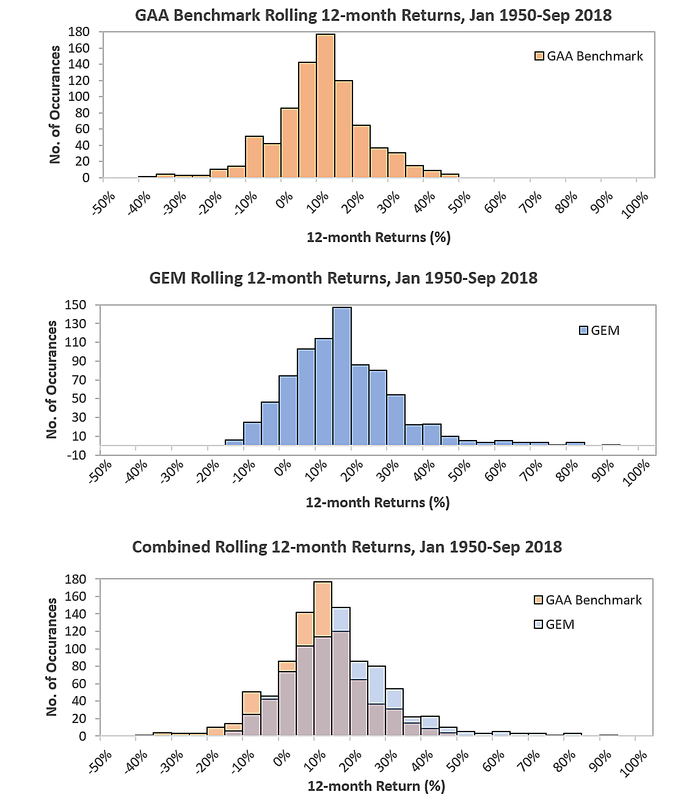 The correlation in monthly returns between GEM and GAA is 0.60 and between GEM and the S&P 500 index is 0.50. There were on average only 1.5 switches per year. So transaction costs would have been minimal. These results are updated monthly on the Performance pages of my website. To better understand what is going on within GEM, I separated out its two components, relative and absolute momentum. Relative momentum is where we switch between U.S. and non-U.S. stocks based on their relative strength. It still suffers from equity-like drawdowns. But for investors with a mandate to always be in equities, relative momentum gave 200 basis points more in annual return than the S&P 500. 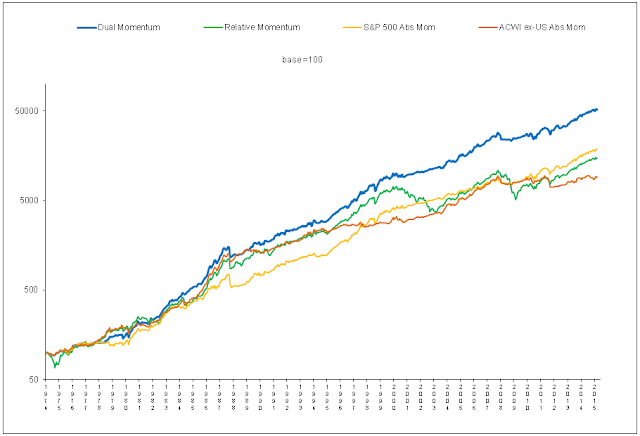 Absolute momentum had 90 basis points more in annual return than the S&P 500. Its lower return than relative momentum is due to occasional whipsaws and lags in getting in or out of equities at their turning points. But absolute momentum gave reduced drawdowns. There is a synergy in combining both types of momentum. Their combined whole is greater than the sum of their parts. If you reduce bear market exposure using absolute momentum, you gain more from relative momentum in bull markets. 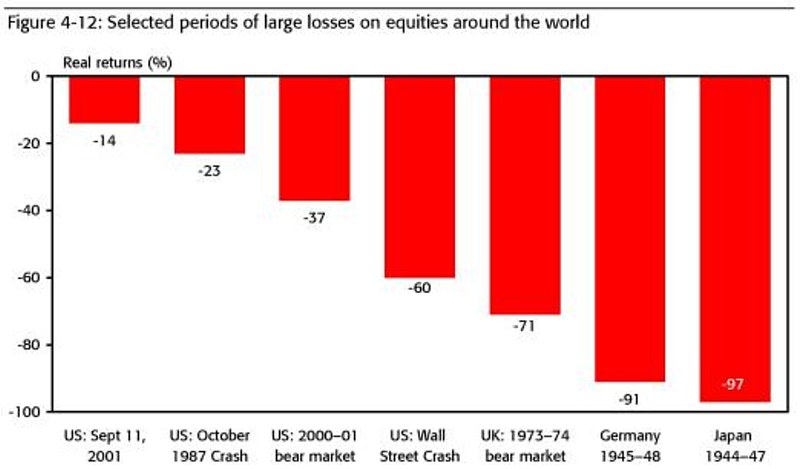 For example, the average bear market loss of the S&P 500 index since 1950 is 33%. It takes a 50% gain to recoup that size loss, and the stock market gains about 10% per year. So, it can take 5 years on average to reach breakeven. If absolute momentum reduces bear market losses, then bull market gains become new profits instead of making up these losses. That is why GEM shows an impressive 440 basis point increase in annual return above the S&P 500 from 1950 until now, versus 200 basis points for relative momentum and 90 basis points for absolute momentum. As with absolute momentum, GEM returns were achieved with considerably reduced downside exposure. Here are tables showing how absolute and relative momentum performed during bull and bear market cycles. Absolute momentum alone gave less profit than the S&P 500 during bull markets. But dual momentum-based GEM produced more profit. Relative momentum by itself suffered nearly the same bear market losses as the S&P 500. But GEM, over the long run, eliminated those losses over this 68 year period. Fama and French call momentum "the premier anomaly." With the growth in factor-based investing, more investors are now willing to use momentum in their portfolios. Trend following has also been gaining traction. Academic research on trend over the past few years as shown here, has switched from hostility to skepticism to acceptance. For investment professionals, there is also potential career risk. All strategies that diverge from the market will at times underperform. If you lose money when everyone else is losing money, you will likely keep your clients. But that changes if you are doing something different and lose money when others are not. Clients who are not well-educated about quantitative investing may leave. 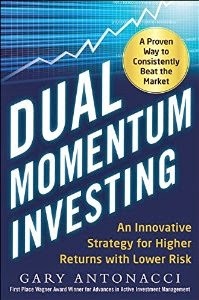 Ironically, the biases that keep many investors away from dual momentum are reasons why it works as well as it does. The behavioral explanation of momentum starts with underreaction to relevant information. You can never be sure of the future, and there will always be tracking error when you deviate from a benchmark portfolio. So we can understand those who are comfortable having multiple investments. Here are some allocation scenarios to consider. They show GEM combined with GAA over the past 68 years.